You know this thing about Maya the Bee Games? On www.cute-games.com we have created the Maya the Bee Games category, based on the 2014 film with the same name, which is in turn based on a very popular children’s book. The games on this page are all very fun to play, and we are sure they will not bore you for even one second, so get to playing them right now, and have fun! In Maya the Bee Games you can find 3 games that we've published for these kids and childrens that are interested to play Maya the Bee Games, this game gategory have been created on 01.07.2016. These games with Maya the Bee Games have been voted 1 times and the avarage of vote is 5.00 stars. We advice you to play the last flash game from Maya the Bee Games, Maya the Bee Coloring that have been published on 02.07.2016 19:03. Maya the Bee Coloring its a part of Maya the Bee Games category and until now its played 898 times. Try it now on Cute-Games.com! 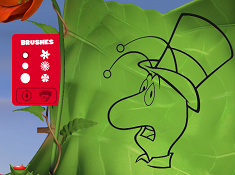 If your like the Maya the Bee Coloring game you can write a comment in the game page. Recommend this game to your friends if you like it! 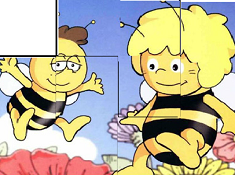 Maya the Bee Puzzle its a part of Maya the Bee Games category and until now its played 683 times. Try it now on Cute-Games.com! If your like the Maya the Bee Puzzle game you can write a comment in the game page. Recommend this game to your friends if you like it! Maya Flight Explorer its a part of Maya the Bee Games category and until now its played 843 times. Try it now on Cute-Games.com! If your like the Maya Flight Explorer game you can write a comment in the game page. Recommend this game to your friends if you like it! 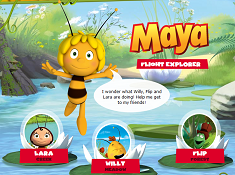 Find More About Maya the Bee Games! Welcome to the page of the Maya the Bee Games category here on www.cute-games.com, the only place where you can now play all the awesome games based on this very interested propriety, which if you are not familiar with already, we are going to use all this description to tell you all you need about it, and after you are done reading, we are sure that you will want to play the very fun and interesting Maya the Bee Games that we currently have on this page, and which are going to be added in the future. Now, you might have heard about Maya the Bee in 2014, when a feature film with this name was released, an animation picture of course, which in turn was an adaption of a cartoon series of 78 episodes of 13 minutes each, with the same title of course, which was released in Germany in 2012. Yes, this series comes straight from Germany, as the film was released only as a direct to video feature in the U.S., but that does not mean that the series is not popular at all. Since it comes from Germany, where it is successful, we are sure that german children who will be searching the internet for Maya the Bee Games, are going to be very glad to find so many of them here, on our website! There was also another Maya the Bee film, made way back in 1924, and in 1975, an anime series was released, so we can see that this interesting story and it’s characters keep coming back through history, and we think that because there are so many adaption, children must love them. Well, the Maya the Bee Games category is going to include as many games based on all these proprieties from the franchise that we’ve mentioned, in hopes of creating a very enjoyable category where you will be able to find many interesting games for all of you to play and have fun with. Of course, we are going to continue the description that you are reading right now, and tell you more things about Maya the Bee, so that even if you did not know about this character before, you are going to learn about it, and hopefully, want to play Maya the Bee Games here, on our incredible website. First of all, you should know that the animations are adapted of a series of books with the same name, which is the way that this character was introduced to children in the first place. It follows the main character, a little bee called Maya, who starts off as a young and naive bee, but through her adventures, she becomes a responsible member of the bee community, because as you know, bees live together in nests, and have their own society and their rules. The adventures of Maya and her development mirror that of real children, so those who read about her or watch her can learn from her mistakes, and learn valuable life lessons. In the beginning of ther story, her hive is dividing into two new colonies, and despite Mrs. Cassandra's warnings, who is her guardian, Maya leaves the hive and goes off on an adventure, even if that is against the rules. Because she broke the rule of the hive, Maya has to learn to befriend other insects, and together they face difficulties and have all kinds of adventures. When she is taken hostage by hornets, the bees enemies, she learns of their plane to attack the hive, so she has to choose between showing up back home and facing consequences, or leaving the hive in the hands of the hornets, and saving her own skin. Of course, she returns home, and because of her warning, the hive survives the attack, and in the end, Maya is pardoned. We hope that you enjoyed reading all this, and after finishing reading about Maya the Bee, you are now also more curious of playing Maya the Bee Games, here on www.cute-games.com! Well, we hope you are, because we have prepared very interesting Maya the Bee Games, like a game where you get the chance to fly with Maya and explore your surroundings, making for a very enjoyable flying game, or you can try a very interesting jigsaw puzzle to solve, which features Maya the Bee. Of course, our team is going to be on the lookout, so that anytime that new games based on this franchise are going to appear on the internet, you can be sure that we are going to add them here for you. Well, that is all we can tell you about the Maya the Bee Games category, so waste no time, and begin playing the games right now! Remember to also show them to your friends, so that they can also get the chance to play these fun games and have a lot of fun!